United Nations Secretary-General, Ban Ki-moon, paid tribute today to His Highness the Amir of the State of Kuwait, Sheikh Sabah Al Ahmad Al Jaber Al Sabah, for his leading support to humanitarian causes around the world. 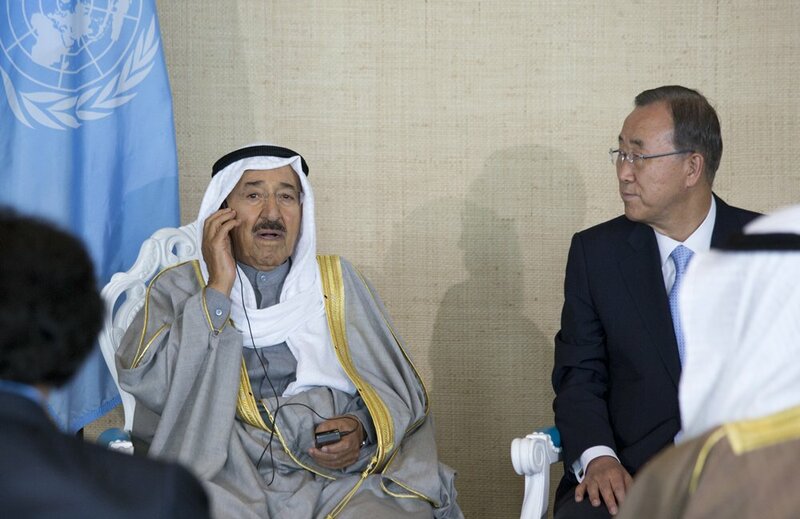 “We thank the Amir and the people of Kuwait for their outstanding generosity towards people in need,” said the Secretary-General. UN Undersecretary General for Humanitarian Affairs Valerie Amos said ” Kuwait’s contribution to the work of the UN and the international humanitarian system goes far beyond funding “. “I would like to express my deep appreciation to the State of Kuwait for its remarkable efforts to address humanitarian crises around the world, particularly in Syria and neighboring countries, as well as on the African continent,” Amos added. “Through the commitment and hospitality of His Highness the Amir and the Kuwaiti Government, Kuwait hosted two very successful high-level international humanitarian pledging conferences for Syria in the space of a year, the first one on January 30, 2013, and the second one on January 15, 2014. The results were unprecedented, with a total of USD 3.6 billion pledged in support of humanitarian operation in and outside Syria. “I also express deep appreciation to His Highness the Amir of the State of Kuwait for his agreement on the appointment of his Special Adviser on Humanitarian Affairs, Dr. Al-Maatouq as the Secretary General’s Humanitarian Envoy. This appointment has enabled greater collaboration on humanitarian issues between the State of Kuwait and the United Nations, and has had a positive impact on the work of Kuwaiti civil society and NGOs in support of humanitarian action around the world. His Highness the Amir Sheikh Sabah Al-Ahmad Al-Jaber Al-Sabah, announced in a speech before the ceremony that Kuwait would double its annual contribution to the Central Emergency Response Fund (CEFR) to USD one million. “I am pleased to announce before you, doubling our fixed annual voluntary contribution to the Central Emergency Response Fund (CERF) to USD one million,” … Highly appreciating the honoring as a “special occasion,” said Sheikh Sabah. “Kuwait, since its independence and gaining the UN membership, has followed a steady approach in its foreign policy, based essentially on humanitarian assistance to all needy countries “regardless of their geographic location, religious beliefs or ethnic origins.” This assistance is in “pursuance of its belief and conviction of the importance of international partnership, as well as the unification and activation of international efforts, aimed at the maintenance and preservation of the foundations of life, that is the human spirit,” said His Highness the Amir.